When bees, hornets, or wasps invade your home’s structure, it’s important to address the situation as quickly as possible. Removing stinging insects is not something you want to attempt and why contacting a NJ pest control service is necessary. Most everyone has come across a beehive, wasp or hornet’s nest dangling from the eave of a roof or seen the insects flying in and out of crevices in a wall’s exterior. These “sweet spots” are the perfect location when bees, hornets, and wasps are on the lookout for prime real estate locations to build their nests. One way to make the prospective location a less than desirable building spot is to apply a bug spray specifically formulated for these three insects. If there are no signs, yet, of any insect activity, spray along the eaves, around windows and doors, and any other place you’ve previously seen the insects. Douse the areas thoroughly so the scent will dissuade the insects from building. If bees, wasps, or hornets have already set up a residence, contact a NJ pest control service immediately. At Stern Environmental, we take our job seriously to provide the best services available. 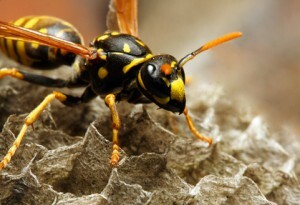 If you’re experiencing a hornet, bee, or wasp problem, our NJ pest control technicians are trained specialists who can take care of the situation. Call to set up an immediate appointment and be sting free.